It’s a real zoo these days inside assisted living centers and nursing homes. Cats napping on the beds, dogs padding through the hallways. And that’s just the way the residents want it. An increasing number of senior care centers, places that once wouldn’t let anything with fur in the front door, now welcome companion animals. Many facilities have a house pet, and some allow seniors, like Georgia Pritchard, to room with their four-legged friends. “He almost talks. He knows what I’m saying,” said Pritchard, an 88-year-old widow with no children. She’s talking about O’Reily, a black and white cat she shares a room with at John Knox Village in Pompano Beach. But there is another reason, too: It’s good for business. Allowing pets is an amenity consumers want, like transportation and flexible meal plans. A Place for Mom, the nation’s largest senior housing placement company, says about 40 percent of their callers now ask about pet policies. “More and more, we have families indicating up front that [allowing pets] is a must-have criteria,” said senior vice president Tami Cummings. In the past, facilities cited health regulations when barring animals. But the two Florida agencies that inspect or monitor nursing homes and assisted living said no rules prohibit companion animals. 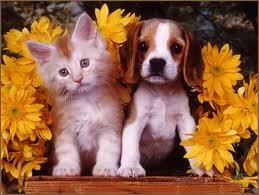 Infection control, environmental or resident rights issues due to pets are dealt with on an individual basis. At the Clare Bridge Alzheimer’scare unit at the Homewood Residence in Delray Beach, residents adopted Scout, a large black stray cat missing a foot, from an animal rescue group. Scout now has a box of toys, two beds and a regular spot on the Clare Bridge activities calendar. Residents gather to pet him, discuss his care or play with him things designed to stimulate their memories and get them out of their chairs. The eight women at Scout’s session one recent morning smiled and nodded when asked if they once had a dog or cat. One called out the name of her pet, gone for many years, as Scout played with a feather on a string. Some elders adopt a pet after moving to an assisted living facility because they couldn’t have one in their retirement condo. Others bring their pets with them. Madison Fleaks had been in Texas Children’s Hospital in Houston for over six months waiting for a heart transplant. She was born with a congenital heart condition. Not yet two years old, she may have forgotten much of her life at home. But she still remembered her two dogs; their photograph sat framed next to her hospital bed. “If you said anything about the dogs, she would point and want to kiss the picture,” said her mother, Tabitha Fleaks. Madison has been in and out of hospitals, she said, enduring multiple surgeries. 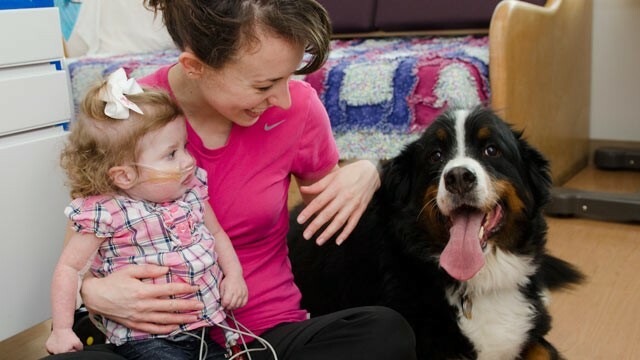 So when her dog Kodiak showed up in her hospital room one day, Madison was thrilled. Texas Children’s is not the only institution to allow some patients to have visitors of the canine variety. ABC News reached out to hospitals around the country and found that many have pet therapy programs, in which a trained owner-volunteer will bring a dog to the hospital for patients to enjoy. These programs have been said to help patients with their mood, pain, and comfort levels. Madison Fleaks at the hospital with her mother, Tabitha Fleaks, and her beloved dog, Kodiak. A growing number of these hospitals have taken their pet therapy programs even farther, allowing patients to have visits from their own pets. The program started at Texas Children’s four years ago, when administrators were approached by an organization called PAWS (Pets Are Wonderful Support) Houston, a non-profit organization the helps to sustain the relationships between pet owners and their pets during a prolonged hospitalization. Here’s how it works: a social worker or child life specialist, hearing that a patient has a pet at home, speaks to doctors who can approve a visit. Then PAWS is contacted. They ensure that the pet is vaccinated and has a bath before the visit. A PAWS volunteer will meet the pet and family members at the entrance of the hospital where they perform a “behavior check” to make sure the pet’s temperament is good for a hospital environment. They then take the pet to the patient’s room. In an effort to help K-9 officers injured in the line of duty as quickly as possible, several police officers in California attended a one-day canine first-aid training session orchestrated by the Police & Working K-9 Foundation and Pet Food Express. Several veterinarians donated their time and expertise to help train the police officers. Learning to find a pulse and perform chest compressions on their four-legged partners is not exactly standard police training, but it was important to the police officers and sheriff’s deputies who practiced those skills Tuesday. 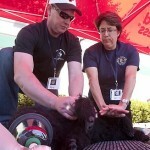 The voluntary training gave K-9 handlers from the Oakland Police Department, the Redwood City Police Department, the Dos Palos Police Department and other Northern California public safety agencies the chance to learn emergency medical techniques that could save the lives of the dogs that serve with them. Just like their law enforcement officer partners, K-9s have been shot at and exposed to narcotics on the job. It’s unlikely that paramedics or other first responders would be able to help with canine trauma since their training and priority is helping humans, Schmutz said. The training, held in Oakland by the foundation and Pet Food Express, helped officers learn what to do in the few critical minutes after an animal is hurt, time that could decide whether they live or die. The officers received hands-on training to learn how to apply splints and bandages to live dogs and practiced CPR on dummy dogs with the help of volunteer veterinarians. These skills are not taught to K-9 handlers in most police departments because of financial constraints, said Steve LeCouve, president of the Police & Working K-9 Foundation. “When I was a handler, there was nothing like this, and we wanted to change that,” said LeCouve, who is a Sacramento County Sheriff’s deputy. Without the emergency training, many critically injured dogs have to wait until they are able to see a vet. As a deputy, LeCouve wants to be able to save the dogs’ lives, but he also wants to protect a valuable crime-fighting asset. “They’re a community resource,” he said. An untrained K-9 can cost as much as $10,000, and most police departments have at least three people to train it. After paying the initial cost and at least three salaries, little money is left over to pay for dog emergencies, LeCouve said. “Why wouldn’t you want to protect that investment?” LeCouve asked. The nonprofit foundation also donates bulletproof vests for the animals and heat alarms for police cars that transport K-9s so the dogs don’t get overheated. The 50 officers receiving training Tuesday were given the animal equivalent of first aid kits so that they did not have to enter the field unprepared. The enrollment for the one-day course was smaller than the normal 70 handlers, according to the foundation, but there was a waiting list for an upcoming session in Sacramento. For many that signed up, the care for the dogs extend beyond protecting police property. “These dogs are like family, and for some, it’s their children,” LeCouve said. Copyright 2012 Contra Costa Times. All rights reserved. Open the jaws to check for obstructions, and if any exist and are not easily removed, try to dislodge the object. See our article Heimlich Maneuever for dogs for details on how to dislodge a dog’s blocked airway safely. The following diagrams illustrates how to perform chest compressions on dogs with different chest types. Click on an image to see a larger version. Figure (A) illustrates the technique for most dogs. You can apply chest compressions to the widest part of the chest while the dog lies on its side. Figure (B) illustrates the technique for barrel-chested dogs. Figure (C) illustrates the technique for barrel-chested dogs. 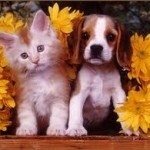 For small dogs and cats chest compressions can be administered two ways. Click on the images to see a larger version. Figure (A) illustrates wrapping one hand around the sternum while supporting the back. Figure (B) illustrates two-handed compression. Below are a couple of videos on administering CPR on dogs. The first is instructional, while the second is a recorded incident of CPR used for an emergency situation. Note: The instructional video below recommends a compression to ventilation ratio of 15 compressions followed by 1 breath. The June 2012 study recommends a compression to ventilation ratio of 30 compressions followed by 2 breaths. When an older female dog uncharacteristically urinates in the house, veterinarian Linda Janowitz writes that several potential causes should be considered, including kidney disease, diabetes, a urinary tract infection and urinary incontinence — a weakening of the bladder sphincter caused by a lack of estrogen in older spayed dogs. A veterinarian can determine the cause and treatment after examining the dog, Dr. Janowitz notes. Several possibilities could explain your dog’s behavior. She could have a urinary tract infection, which can make her urinate more often, and she may not be able to hold it until she gets outside. That would be the best-case scenario as it is usually easy to treat with antibiotics. 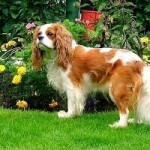 Other conditions can also be an issue with an elderly dog. I would want to rule out diabetes and kidney disease. With both of these conditions, you would probably see her drinking more water and urinating more in general. 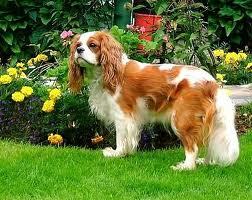 Last, but perhaps most importantly, your dog may have hormonal incontinence. In spayed female dogs, especially as they age, the lack of estrogen can cause the urinary sphincter to become weak. Often these dogs will leak urine in their beds. A combination of factors may be contributing to your dog’s behavior. You could also be right about the cold weather. It could be the only reason for her behavior or a contributing factor. I would recommend first scheduling a visit with your veterinarian for blood work and a urinalysis to rule out many conditions that cause increased urination. If your dog’s problem doesn’t have a medical cause, try using puppy pads placed in convenient locations on colder days. It might help if you try to associate a word command with urinating, so she knows what you expect when you go outside. When she does urinate, use the word and praise her. You could also reward her with a treat when she urinates outside. Linda Janowitz, DVM, is the director of veterinary medicine with the Peninsula Humane Society and SPCA. Bear, a family’s black Labrador retriever, saved an Indiana toddler from drowning. After noticing her 14-month-old wasn’t walking behind her, Patricia Drauch went to the family’s pool where she found Bear keeping the unconscious boy, Stanley, face-up in the pool. Veterinarians and other animal-oriented businesses are providing creative solutions to curb the pet obesity epidemic in the U.S., offering extended, customized weight-loss programs complete with diet modification and exercise therapy on-site. The Association for Pet Obesity Prevention found that roughly half of U.S. pets are overweight, with one of every five tipping the scales at 30% over their ideal weight. Telling yourself it’s finally time to sign up for the gym and shed some pounds is hard enough, but getting your dog to drop weight? That can be even tougher. Erin Kowalski, 30, of Humboldt Park learned that a few years ago when her chocolate lab, Zeus, ballooned to 110 pounds—about 36 pounds overweight. While a healthier diet and extended walking regimen produced noticeable results for her dog, Kowalski turned to a relatively new option to get Zeus to a healthy weight. She signed him up with a Logan Square pet clinic that specializes in animal weight loss. The clinic has all the bells and whistles you’d expect at a neighborhood gym—from laser therapy to acupuncture to workouts with exercise balls. Turns out, an underwater treadmill and resistance pool was the secret to Zeus’ slimdown. Pet owners in Chicago are taking new measures to help Fido burn the fat. Specialty care facilities, which can cost hundreds of dollars for multi-week regimens, offer human-like ways for dogs and cats to shed pounds. There are even bootcamps designed for pet and owner to work out together. Meanwhile, pet owners across the country are spending tens of millions of dollars every year to treat issues that are brought on by their pets’ weight. While Americans themselves are facing a national obesity problem, their pets are tipping the scales as well. More than half of adult dogs and cats are overweight or obese, according to the Association for Pet Obesity Prevention, and about one in five of them weighs in at more than 30 percent over its ideal body weight. The surplus pounds can lead to a host of health issues including arthritis, diabetes and problems with the hips, kidneys and liver. And while fat cats like Meow, the 39-pound feline whose photo was passed around online before he passed away last month, have been talk-show punchlines of late, experts say the issue is something to be taken seriously. Ward said the issue of animal obesity has gained traction in recent years, going from a subject that was brushed off when the association was founded in 2005 to a topic that is beginning to open the eyes of pet owners. Megan Ridley, a veterinarian at Integrative Pet Care, the Logan Square clinic that helped Zeus, said she treats animals she believes are morbidly obese. Ridley said it’s rare to see an animal come in for treatment solely for weight issues. Usually, she says, existing problems such as arthritis, hip dysplasia and other issues that cause pets to be less active have been made worse by being overweight or obese. But it does happen. One recent client brought in a dog who was fed a diet of table scraps for a year and a half. The dog that should have weighed 65 pounds soared to 90. “You could see it was starting to have issues with its wrists,” she said. Ed Heil, owner of Integrative Pet Care, said eight- to 12-week treatments range from $800 to $1,400, and can include boarding. Heil said the rehab and weight loss can prevent costlier procedures. Hip surgery for a dog or cat can cost at least $3,000 to $4,000. Saq Nadeem, founder of the resort-style boarding service Paws for Pets, said he has seen a growing number of customers willing to pay for extra services that help their pets get in shape. The company didn’t always offer treadmill fitness or nature hikes for dogs, but demand for those services has grown as owners increasingly spoil their pets as they would their own children. Diana Ozimek, a trainer who runs fitness boot camps for women in Chicago, has her own solution. After seeing many pet owners who abandoned the gym to care for their pet, she developed a workout routine for canines and their owners alike. The challenge, she says, is that pet owners see jogging as one of the only ways to work out in tandem with a dog. But her four- and six-week boot camps, which she began teaching about a month ago, incorporate light training for the dogs along with cardio and weight training for their keepers. A fat cat or plump pooch doesn’t just cause problems for the animal; it also can wreak havoc on an owner’s finances. Pet insurance provider Petplan said it saw a 348 percent rise in arthritis claims in 2011, as well as a 253 percent increase in diabetes and 32 percent incline in cardiac arrest claims, all of which are associated with extra weight. The company says costs add up. These figures don’t include the basics of pet ownership. The American Society for the Prevention of Cruelty to Animals estimates the minimum cost of owning a small dog in its first year is $1,314. That number rises to $1,580 and $1,843 for medium and large dogs, respectively. For cats, owners can expect to pay $1,035. Tufts veterinarians developed two quantitative tests for pets with heart disease that can help owners make decisions about treatments and euthanasia. FETCH (Functional Evaluation of Cardiac Health) and CATCH (Cats’ Assessment Tool for Cardiac Health) are surveys that ask owners to rank aspects of their pet’s health from zero to five. JAVMA published evaluations of both FETCH and CATCH. (Phys.org) — Quality of life has become accepted as an important predictor of survival among human patients with heart failure. Now veterinarians at the Cummings School of Veterinary Medicine at Tufts University have developed two surveys that may prove to be similarly useful in evaluating the quality of life for dogs and cats with heart disease. 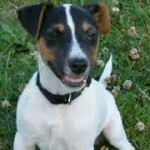 More information: J Am Vet Med Assoc. 2012 May 15;240(10):1188-93. (CNSNews.com) – Although the Justice Department has extended the deadline for America’s hotels to comply with regulations regarding handicap access to swimming pools, new Americans with Disabilities Act (ADA) guidelines are already being applied at miniature golf courses, driving ranges, amusement parks, shooting ranges and saunas. “Miniature horses were suggested by some commenters as viable alternatives to dogs for individuals with allergies, or for those whose religious beliefs preclude the use of dogs,” the rules state. 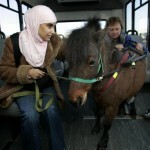 Also mentioned as a reason to include the animals is the longer life span of miniature horses – providing approximately 25 years of service as opposed to seven years for dogs. 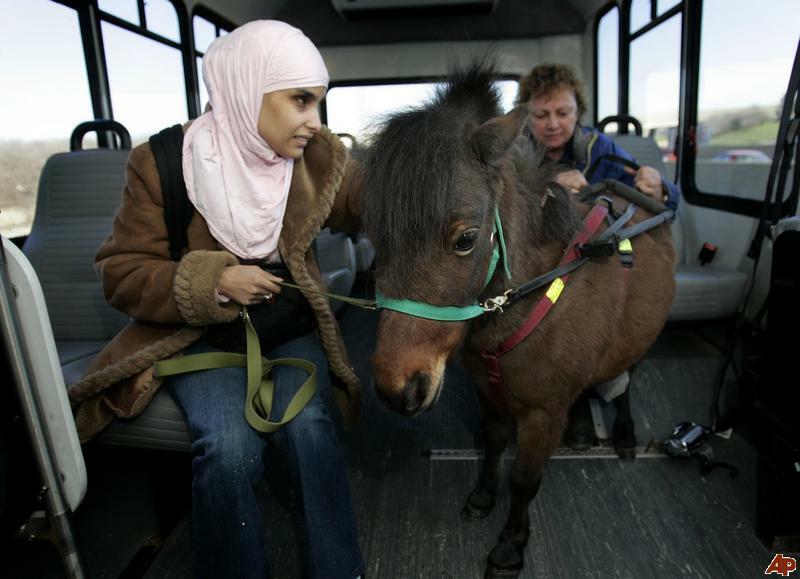 “Some individuals with disabilities have traveled by train and have flown commercially with their miniature horses,” the Justice Department notes.